The giant clams native to the Pacific and Indian oceans are among a unique group of animals that can use iridescent cells to produce color. 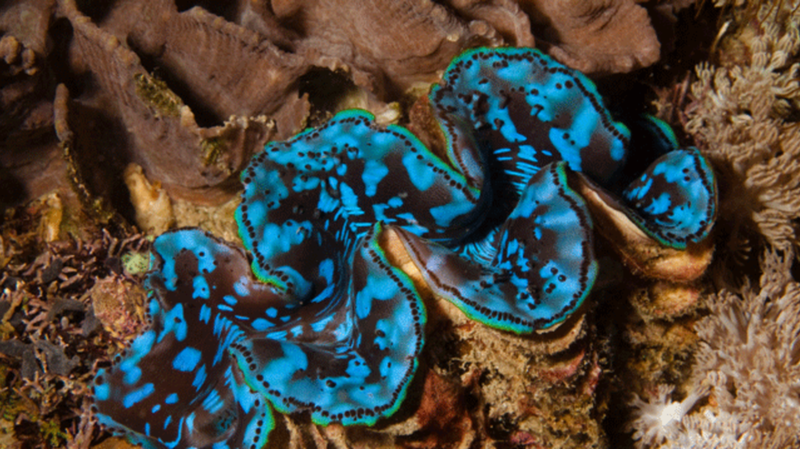 Rather than relying on pigment, these creatures have cells known as iridocytes—like those found on the exterior flesh of a giant clam—that use their structure to scatter light waves and produce iridescent shades. Scientists are hoping that by better understanding how this phenomenon works in giant clams they will be able to create more efficient solar panels and color displays in the future. In a study published this month in the scientific journal Optica [PDF], researchers from the University of California in Santa Barbara detail their investigation into how the clam is able to produce each of its shades. In the species Tridacna maxima and Tridacna derasa, for example, the clams generate their white hues by mixing colors in a way similar to how video displays mix red, blue, and green pixels to create white. Giant clams rely on sunlight to make their color, while most color displays we see today use light sources like LEDs. If researchers can find a way to create nanostructures for screens modeled after iridocytes, then smartphones, tablets, and TVs could possibly use the ambient light around them to generate color. Not only would this be more energy efficient, but it would be easier on the eyes as well. The researchers also looked into how this mechanism in giant clams could be used to improve efficiency in solar panels. "If we could use what we learned from the clams to build a very efficient distributed light-gathering system, then we could use that to make more efficient 3D solar cells that require less area than our present rooftop and land-based solar farms," the study’s lead author Amitabh Ghoshal said in a statement. The team is now moving forward with their findings to design and test solar cells that take their inspiration from clam biology.